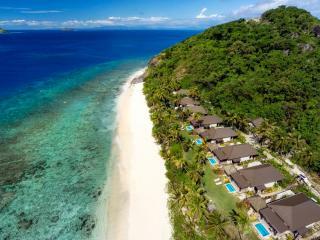 This Fiji accommodation is located on a marine sanctuary in the heart of the Mamanuca group of islands. 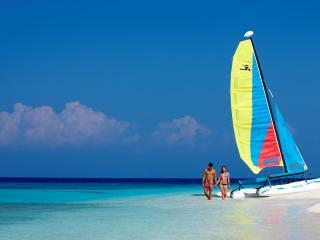 Beachcomber Island Resort is a barefoot paradise allowing you to do as much or as little as you like. The island resort is ideally suited to solo travellers and groups of friends looking for a unique party atmosphere. 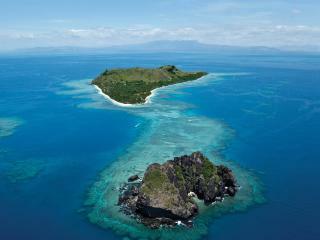 Castaway Island Fiji, situated amongst the waters of the famous Mamanuca Islands, only 30 kilometres from Nadi. This Fiji accommodation resort consists of 64 individual bures with facilities ideally suited to the tropical climate including open air dining and casual bars. Castaway Island Fiji is a popular resort for couples, honeymooners and families or anyone looking for the ultimate island experience. Likuliku Lagoon Resort is the ultimate luxurious adults only resort, featuring the only over-water bungalows of their kind in Fiji. Likuliku has 45 bures in total, all of which are air-conditioned and 10 are suspended over a coral reef lagoon. 36 line the pristine beachfront, some with private plunge pools, and all feature magnificent views of the ocean. 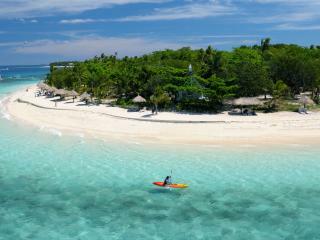 Likuliku Lagoon Resort, located in the Mamanuca Islands, is just 10 minutes by air or 30 minutes by speedboat from Nadi. 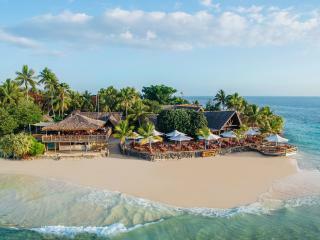 Lomani Island Resort is located in the beautiful Mamanuca group of islands just 15km west of Nadi International Airport, Lomani Island Resort fronts a sprawling 7km white sandy beach and a sheltered, pristine lagoon. This Fiji accommodation has a year round policy of only accepting guests over the age of 16 years making this the perfect location for those seeking total relaxation or a romantic getaway. Malolo Island Resort is an island paradise with pristine white coral sand beaches, panoramic views, azure seas and wonderful facilities. Air conditioned luxury accommodation is set amongst tropical gardens and just a few lazy steps from the waters edge. This Fiji accommodation is ideal for families and couples, there are many activities to enjoy for both young and old, and the Kid's Club is brilliant for children. An affordable Fiji accommodation choice that is ideal for a wide range of travellers including couples, families and groups. Catering for honeymoons, weddings and those travelling with young children Mana Island Resort & Spa has accommodation and facilities suited for most needs. The resort is set on a large island in the Mamanucas with a number of stunning sandy beaches that are lapped by crystal clear water. Enjoy a variety of water sports, diving, fishing, kids club, spa treatments and more at Mana Island Resort & Spa. 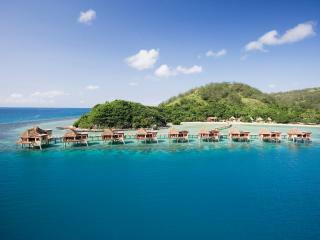 This amazing adults only Fiji accommodation is a set on a small island set 30 kilometres west of Nadi. 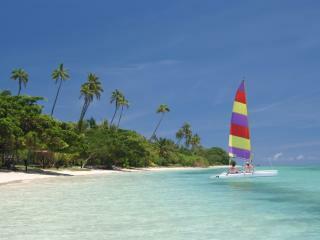 With tropical vegetation and coconut palms, Matamanoa's beach contrasts offering pristine white sand. 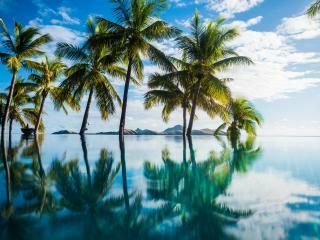 In an effort to achieve this ambience, Matamanoa Island Resort Fiji has adopted a year round policy of not accepting children under the age of 16 years. Perfect for those seeking tranquility with a sophisticated atmosphere. Musket Cove Island Resort overlooks a sheltered lagoon, a haven to many visiting yachts from around the world, and is only 17 kilometres from Nadi. Guests can relax by the pool, one of the largest in Fiji, or try one of the many complimentary watersports including windsurfing, kayaking & snorkelling. The resort is set amongst tropical gardens of coconut palm trees on an island fringed by 12 kilometres of white sand and crystal clear water. 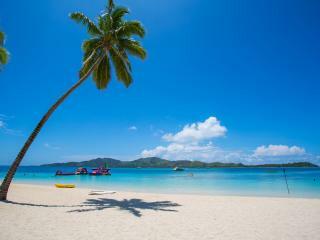 Plantation Island Resort is positioned on a stretch of white sandy beach which fronts the beautiful blue water lagoon. This Fijian Island resort is set 23 acres of tropical landscaped gardens and coconut palms making this the perfect place for total relaxation. Plantation Island Resort boasts 3 swimming pools and plenty of activities including a 9 hole golf course, water activities, cultural and handicraft demonstrations, teens club, kids club and beauty salon. Sheraton Resort & Spa, Tokoriki Island is Fiji island luxury just an hour from Nadi Airport and Denarau Island in the beautiful Mamanucas. This beachfront resort exudes pure tropical bliss with its white sandy beaches, crystal clear waters and stunning infinity edge swimming pool. Apart from the excellent location the resort also offers fantastic facilities such as a day spa, restaurant and free WiFi internet. Tadrai Island is your own personal sanctuary where you can escape the everyday pressures to be pampered and spoilt with the one you love. 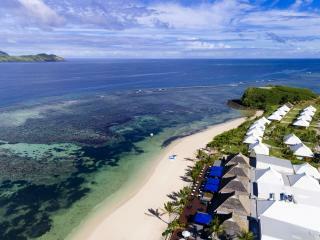 This new exclusive Fiji accommodation comprises of only 5 ultra deluxe beachfront villas each with private plunge pool. Indulge in the 5 star cuisine, with all meals and beverages included in your rate (premium alcohol excluded). 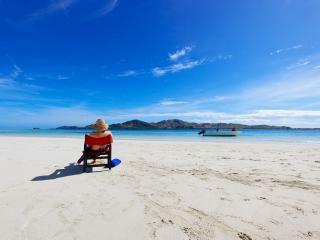 Located on Mana Island, about 30 kilometres from Nadi, just a quick helicopter ride or scenic boat launch to the Island. 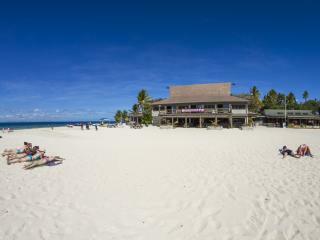 Tokoriki Island Resort, is surrounded by crystal clear waters and fronted by a stunning white 1000 metre sandy beach. Just 35kms from Nadi, accessible by launch, seaplane or helicopter, this small personal resort offers a real island escape without the crowds and is ideal for the discerning traveller. This Fiji accommodation is ideal for couples and romantic getaways, snorkel the clear waters, try diving or relax on the beach. 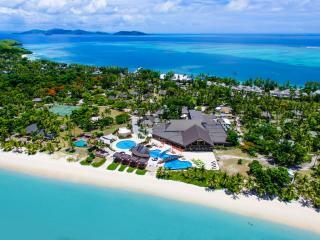 Treasure Island Resort offers 68 fully air-conditioned bures on a private island, all within 30 metres of the beach. Located in a marine sanctuary, there are visiting and resident turtles and an abundance of colourful marine life and coral growth surrounding the island. Daily kids club, free kayaks, sail boats and windsurfing plus great wedding packages make this the ideal destination for couples and families. 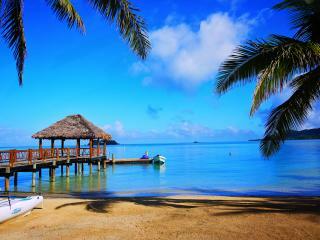 This Fiji accommodation is the ideal destination to enjoy a relaxing Fiji island holiday. Tropica Island Resort is located just a few steps from the water's edge on the island of Malolo. 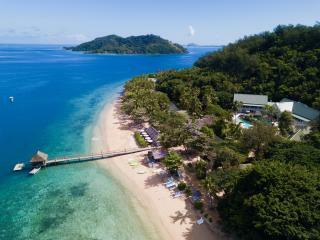 This adults exclusive Fiji resort offers a range of accommodation styles including hotel rooms, bures and suites. Guests can do as little or as much as they please including snorkelling, diving, kayaking, volleyball and of course, sunset drinks! Vomo Island Resort is an upmarket luxury property located 15 minutes by air from the Nadi International Airport. The resort offers superb accommodation, fine dining and features a fresh water swimming pool. Vomo's 32 bures and residences feature contemporary styling and each with special views of the island. Vomo Island Resort caters for honeymoons, leisure travellers, families and those with discerning taste.